Exhibit at The Million Toy Museum in Ayutthaya, Thailand. An ancient Thai city filled with remnants of a turbulent past and millions of toys. Tim Richards takes a nostalgic trip in a unique museum, The Million Toy Museum. Grinning blue deer and smiling violet horses lurk among the tropical plants at the garden’s edge, bearing pink or yellow saddles. Nearby, a troop of terracotta water rats trail across the grass, as if out for a stroll. They’re the welcoming party to an unlikely building set back from the dusty streets of the central Thai city of Ayutthaya. The Million Toy Museum is a big white structure with sky-blue window frames holding dozens of windows. It’s surrounded by a neatly-kept, lush garden scattered with colourful but fading animals salvaged from an old carousel. Watched over by these surreal inhabitants, there’s something other worldly and fairy-tale about the building – as if the witch in Hansel and Gretel had fancied a warmer climate, and set up shop in Thailand. I half expect a wizened old lady beckoning me in with a gnarled finger, suggesting I take a bite of the marzipan architecture on the way. Inside, however, it’s simply delightful. Though a million toys is probably an exaggeration, there must be thousands of them within these walls. They fill the big space, in glass cases along the walls and down the centre of the room, and upstairs on a second level. Curiously, the cases sometimes contain multiple copies of the same toy, presumably to create an artistic effect. In one, I find dozens of red-and-yellow tin goldfish, as if they’re swimming together. Another case is so packed with old-fashioned metal robots, with stiff limbs, grated mouths, and flashing red eyes, that I could imagine it to be a scene from an old science fiction movie. As I move deeper into the museum, I realise that everything is here, every type of toy ever invented: toy trucks with cement mixers on their backs in translucent red plastic; little cuckoo clocks; miniature army tanks, including a futuristic ‘Space Tank’; plush toys; spooky life-sized baby dolls; enough Ronald McDonald figures to cause a coronary; toy planes and rockets stacked against each other; and a veritable flotilla of toy helicopters with yellow plastic rotors. Not far beyond the choppers are a number of beautifully constructed model locomotives made of tin, whose pistons and wheels move. I sigh deeply as Am, the attendant on duty, allows me to pick one up. Surprised, I realise this place is doing exactly what I didn’t think it would do – taking me back to my childhood in the days before electronic toys, aboard the comfortable vehicle of nostalgia. At least I know I’m not alone in my sentimentality. Am tells me the museum was founded by Professor Krirk Yoonpun, a renowned Thai author and illustrator of children’s books. In the 1980s he was awarded a Japanese literary prize for his work. While in Japan he visited two museums with extensive toy collections, which gave him the idea of starting his own. It seems odd that such a light-hearted novelty should exist here in Ayutthaya, which was the capital of Thailand until the Burmese army levelled it in the 18th century. The city is chiefly visited for its extensive ruins, great expanses of half-wrecked temples and palaces which hold a melancholy fascination. 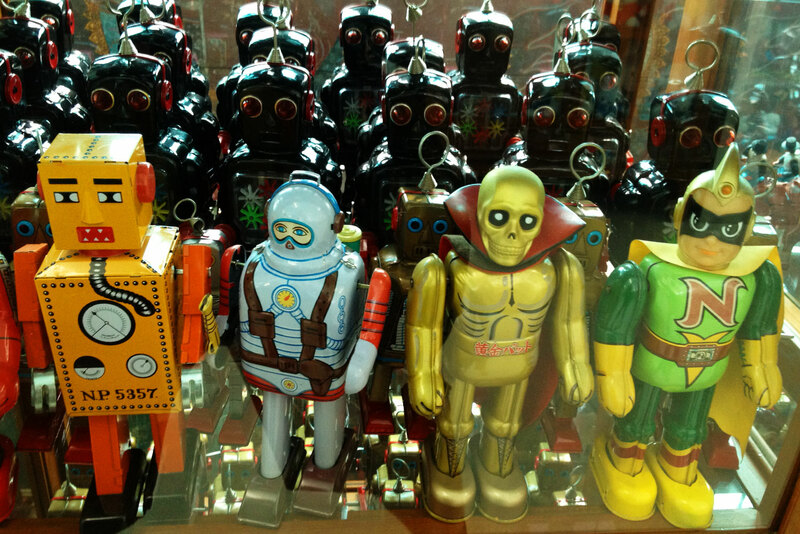 A toy museum might seem out of place amid such grim history; but of course, toys are eternal. In the upstairs section are cases of small clay figures, worn with age. They were salvaged from the ruins of the former royal city, and might well be children’s playthings. Reluctant to leave, I pass a statue of Superman and head down the stairs to the museum shop, where a selection of Yoonpun’s brightly coloured books and paintings are on sale. Apparently the author tears himself away from his teaching work most weekends to come and read to kids at the museum, but I bet he’s also keen to visit his beloved toys. I know I would be. I imagine the professor in the museum late at night after closing time, arranging robots, trains and tin goldfish into pleasing tableaux and the thought makes me smile. Then I step out of this bubble of childlike charm, walking past the gawping carousel animals into the heat and noise of a tropical afternoon in Ayutthaya, and start looking for a tuk-tuk.